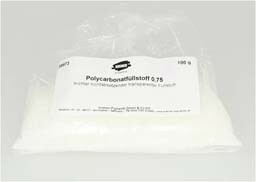 Polycarbonate Filler, 0.75 mm | Structural & Special Fillers | Fillers & Building Materials | Kremer Pigments Inc.
For color pastes and polyester fillers, pentagonal particles, about 0,75 mm. Chemical description Bisphenol and phosgene copolymer, possibly with color pigments. Customer evaluation for "Polycarbonate Filler, 0.75 mm"